I’ve just returned from my vacation to Maritime Canada with the richness of friendship and the marvel of exploring leaving me feeling quite fulfilled from the trip. Each time I visit that part of the country I am always left with an overwhelming feeling that people that live there have it right. They are lovers of life, and truly friendly and joyful people to be with. Life just feels simpler and balanced when with Maritimers in their environment. A comment one of them made sparked my writing for this week. We were in a quintessential “greasy spoon” restaurant for breakfast. It was essentially a plywood sided old building that was past its prime, a 1960-1970 generation sign out front and tables that were tilted enough that you checked to make sure anything you set down didn’t roll off. We were greeted by the owner Anna herself and struck up a good conversation. Anna knows everyone in the area so she knew our host was from the area but had moved to Calgary and that the other two of us were PFA’s (people from away). We identified home as Calgary and the conversation turned to the economy there which is struggling because of the low price of oil. What Anna said next was the spark. “Well I’m sorry to hear that”, she said, “but I guess you’ll learn what it feels like to live like the rest of us.” That hit home for me. The average family income in the city of Calgary is $98,300 per person. 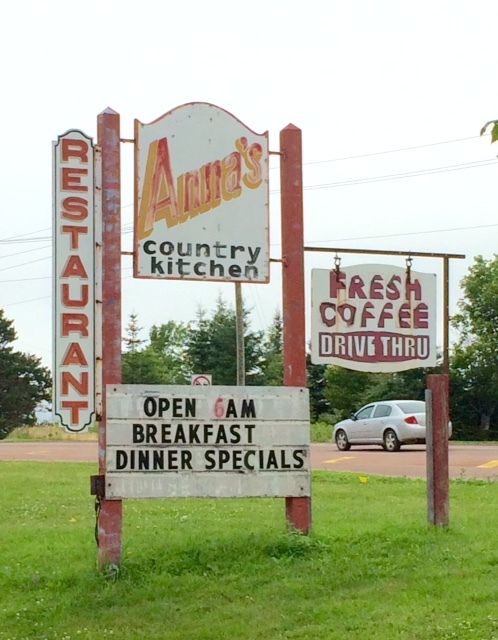 The average income in Prince Edward Island, the province where Anna lives, is $70,300 per person. That’s a gap of 40%, and one that leaves room for her comment. If I think about the number of luxury cars I saw with PEI plates on them during the week I was there, it would be comparable to perhaps 10% of the number I see in a 15 minute drive around Calgary. There are certainly privileges that the prosperity in that city brings. When things are going well in Calgary, often referred to as an oil boom, what I wonder about is whether the average citizen regards themselves as privileged to live and work there, or entitled to the lifestyle that comes with it. Please God, send us another oil boom. We promise not to p!%$ it away this time. Fact number one. Most in Calgary are privileged to have found a way to live there and to work much of the time with a highly paid job. Those that have those jobs openly express how lucky they are to be a part of the oil booms. Fact number two. In good times in Calgary there can be conspicuous consumption. In “bust” times there can be significant shedding of significant assets as overextended professionals try to improve the quality of the family balance sheet. Fact number three. Most of the people who hold those jobs invested significantly in themselves in order to get those jobs. They are well educated professionals, or highly trained / skilled trades people who have proven they deserve the job they have. Out of all of this, two questions have come to mind for me. How well do we display a sense of privilege to what we have versus a sense of entitlement that, despite our own investments in ourselves, we understand that we are lucky to be here? Do we express that sense of privilege by managing ourselves prudently and humbly, ensuring we can manage our lives if things slow down? Do we share our privilege with others less fortunate than ourselves, balancing out the luck of the draw? How well do we create the necessary balance between expectation and gratitude? Expectation is the product of self-confidence, knowing that we have prepared ourselves to be able to take on the specialized roles that the petroleum (and supporting) industries depend on. It is essential for us to be able to perform at our peak. However, without gratitude that we have been given the privilege to be a part of something such as a lucrative economy, is there a risk that is a seed of entitlement – a sense that I deserve this more than someone else – might begin to arise? I am grateful for Anna’s simple comment. It allowed me to reflect on just how privileged I am to be able to live where I live. As far as I can tell the the price of housing is much lower, followed next by savings on lobster and potatoes!? Very thoughtful post Ian. While I sign on each Sunday morning to read your weekly post and leading questions, I’m quite silent. Not this week. As a manager and leader, I live and work with gratitude as a cornerstone. It simply makes me a better leader and manager. There are so many benefits, and researchers have highlighted this over the years, is that gratefulness has strong social dimensions. It improves relationships, both at home and in our workplace, and it’s doesn’t take much effort to pause and reflect. Gratitude requires us to see how we’ve been supported by others and by circumstances. Even in the worst of times, it helps one to overcome and press on, and when you can lead by example, it helps others do the same. Gratitude also encourages us not only to appreciate gifts, but to repay them — I like to think of this as paying it forward. And I’m reminded on your July post this year where you hone in on the mentality and paying it forward at work. Being this thoughtful counts. I like to think that some questions are much more important than the answers that are generated. Your two questions this week may just be of this type. Staying in these questions, as we manage and lead others at work, and manage our life outside of work will keep us in tune and in balance. A lovely post…awakens gratitude…thank you. Thank you Vicki. The gratitude part of this was very important to me. From here is Australia, riding on the back of a resources boom, I like your take on sharing that ‘privilege’ with those less fortunate rather than simply seeing it as our own ‘entitlement’. However, my heart belongs to the concept of eventual renewable energy for both economies. Agreed. We need to become stewards of our world.